That is the music being played as you open this page. This is a recording from 'Trooping the color' ceremony in Horseguards Parade, London. Listen, and you'll hear the commands. Takes a while to download! 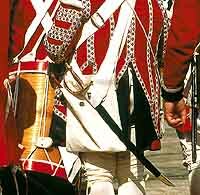 Coldstream Guards: "Figaro" (Mozart 1764). The Welsh Guards: "Men of Harlech"
The Irish Guards: "Let Erin Remember"
The Scots Guards: "The Garb of Old Gaul"
The Grenadier Guards: The British Grenadiers"
The Welsh Guards: "The rising of the Lark"
The Irish Guards: "St. Patrick's Day"
The Scots Guards: "Highland Laddie"
(originally known as "Cockleshells" and written in 1701). The march is taken from the opera, "The Mercy of Scipio" or 'Scipione' written in 1725 by George Frederic Handel. Since Scipio was a Roman centurion, this piece is played with grandeur. The poem "Toll For The Brave" written by William Cowper in 1782, was often sung to the march. Handel transcribed the march from Scipio for harpsichord, a good example of Handel's 'borrowing'. He often recycled tunes that he wrote for one type of composition, using them in another. the fact the Princess Caroline was in attendance. Although Handel was painted as a glutton by some, he made many jokes at the expense of public figures and was well loved by the British people for his pious and honorable nature, and was buried in Westminster Abbey in 1759. While operas were generally performed in theatres at the time, much of the popular music from these works would be performed at the pleasure gardens in London. Vauxhall Gardens and Ranelagh were magnificent assemblages of pavilions and gardens, where people could escape the noise of the city, and stroll, listen to music, partake of elegant suppers, and generally amuse themselves. The most notable musicians of the day performed in these lovely surroundings, including Handel, the violin virtuoso Felice de Giardini, and singers such as Miss Brent, for whom Thomas Arne wrote many of his songs. The programs included orchestral, organ, chamber, and vocal music. Songs that had been successfully performed with orchestral accompaniment at the pleasure gardens were frequently published the following year in arrangements for voice with a small instrumental ensemble, so that they could be enjoyed by music lovers at home. Popular at the time it was composed, many of Handel's operas are not frequently heard (unlike his orchestral music, and his oratorio 'Messiah'). Today the operas can seem a little tedious, and certainly strange, since the sound of the lead male alto is other-worldly. Nowadays we prefer to hear a tenor lead. Antonio Salvi and on the histories of Livy. It is sung in Italian. with his beloved Armira, released now from Roman captivity. In the opening campaign of the Second Punic War, Publius Cornelius Scipio was 17 or 18 years old. His father, also named Publius Cornelius Scipio, was elected a Roman consul in 218 BC, and the young Scipio accompanied him in a confrontation with Hannibal's invasion force in Northern Italy shortly after the Carthaginian commander had completed his famous crossing of the Alps. In the melee that ensued, the elder Scipio became surrounded and was seriously wounded. Perceiving his father's danger, Scipio the younger urged his troops into the thick of the fighting. When they hung back, the boy rode into the enemy cavalry alone, compelling his men to follow. That attack broke the Carthaginian formation, and the elder Scipio later saluted his son before the army as his rescuer. Scipio began trained his men in tactics he had learned by studying Hannibal's battles in Italy. He experimented with a smaller infantry unit, the cohort, which allowed greater flexibility of maneuver than the legion. In addition, Scipio armed his men with short Spanish swords (the gladius hispaniensis), replacing the unwieldy weapons used in the past. He continued to great victories in Spain and North Africa against Hannibal, always using innovative tactics and methods. Before a battle with Hannibal, Hannibal sent three spies to obtain information. The three were captured, but instead of putting them to death, as was customary, Scipio appointed a tribune to take all three men on an inspection tour of the camp. Scipio's unusually generous treatment of his spies so impressed Hannibal that he arranged to meet the young Roman commander a few days later, alone except for two interpreters. Their parley was cordial, but they failed to negotiate a peaceful settlement. the name of the land he conquered: Scipio Africanus.